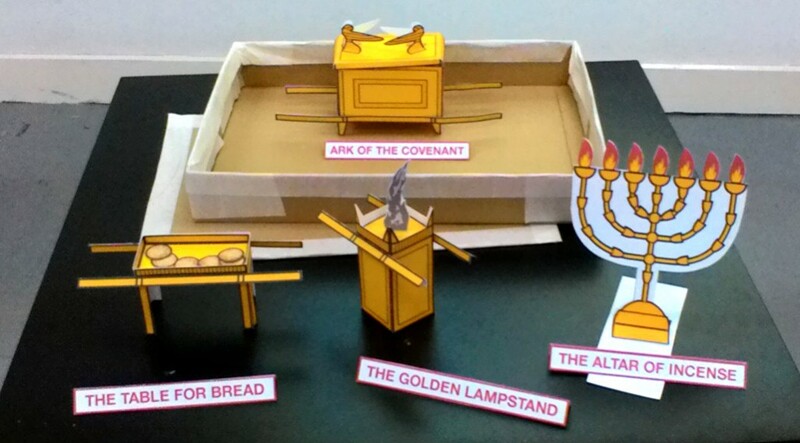 God planned the tabernacle to the smallest detail because each part — every furniture, ritual and sacrifice — was a picture of what His son, Jesus will do to save the world from sin. Bronze laver Jesus washes us clean (Heb 10:22) so we can enter God’s presence boldly and with confidence. Menorrah Jesus is the light of the world (John 1:9). Table of Showbread Before He died, Jesus took bread, broke it and gave it to His disciples saying “Take and eat; this is my body.” (Matt 26:26). On the cross, Jesus’ body was broken so that you and I can be made whole. Altar of Incense Jesus is a pleasing offering; He intercedes for us daily at the right hand of God. Jesus stands between a holy God and sinful man. The High Priest sprinkled animal blood on mercy seat to cover the sins of the Israelites. Christ’s blood was shed to wash away the sins of the entire world.Romans 3:23-25 for all have sinned and fall short of the glory of God, 24 and all are justified freely by his grace through the redemption that came by Christ Jesus. 25God presented Christ as a sacrifice of atonement (mercy seat), through the shedding of his blood—to be received by faith. Heb 9:11-12 But when Christ came as high priest of the good things that are now already here, he went through the greater and more perfect tabernacle that is not made with human hands, that is to say, is not a part of this creation. He did not enter by means of the blood of goats and calves; but he entered the Most Holy Placeonce for all by his own blood, thus obtaining eternal redemption.